13% of the U.S. population eat pizza on any given day, with about one in six Americans eat it for breakfast, lunch, or dinner every day. And survey conducted by National Today shows pizza is the second most popular fast food (behind hamburgers) in America. 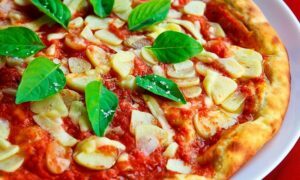 While order pizza delivery is easy, preparing pizza at home can be a daunting challenge and it can be tricky to achieve a crispy base. then you should definitely check out these 11 top rated kitchen gadgets and cool products on Amazon that are highly recommended by other pizza lovers! Slice your favourite pizza like a PRO with this lovely pizza cutter designed by Kitchy. A cool slicer that fits nicely in the palm of hand, with protective blade guard that protects hand from cuts. Super easy to clean, dishwasher safe, and it can be easily disassembled for cleaning. Joseph Joseph 20085 Adjustable Rolling Pin with removable rings at either end is a smart design that takes the guesswork out of preparing pizza, biscuit, and pastry dough. This rolling pin has 4 sets of removal discs to make it simple to roll to a desired pastry thickness, and to the exact size required. The discs’ size are 1/16-inch, 1/6-inch, 1/4-inch, and 3/8-inch. This high quality 15.75″ stainless steel baker roller by Ultra Cuisine is a premium product for homemade pizza maker. At 10 oz, the French design of this kitchen gadget can help user to create perfectly rolled dough. You can use it to roll pizza, cookies, pie, fondant, etc. Want to make restaurant Pizza at home? #4: Creative Pizza Cone Gadget – Cool! If you want to add some creativity and uniqueness, this interesting gadget lets you make pizza CONES. It’s a regular pizza, just that it’s more fun to eat. Watch the video below to get some inspirations. A great idea if you want something more unique to serve your guests in a party. >> Check out Pizzacraft Grilled Pizza Cone Set and Have Fun! Want hot meal experience or reheating last night’s pizza? Consider the patented Hot Logic portable oven, which is great for anywhere you have an outlet (eg, office, job site). With over 2,800+ positive user reviews, you know this innovative product is very popular and loved by many people! Watch the video below to have an overview of this super awesome and useful product. Presto Pizzazz Plus is designed to bake pizza, but it can also be used to prepare many other food such as cookies. The rotating tray of this cool oven turns continuously to assure even baking. Fabiana Buontempo tried this interesting kitchen appliance and shared her experiment results in the video below. An unique 6-Person countertop Mini Pizza Oven with Terracotta Dome and pizza cooking stone. This electric Pizzarette mini pizza oven with dual heating elements is ideal for a pizza party with friends. As shown in the video below, Rick Mammana has lots of fun using his new Pizzarette oven to make crispy pizza! The unique Thermarite provides an even heat to the pizza for better crusts. Good in ovens and grills (gas or charcoal), this product is certified safe by passing US FDA, RoHS, European Union & German Food Code Safety Standards. In video below, Robert Veach shares his homemade pizza experience with this pizza stone. This premium quality pizza paddle with easy grip handle is superb for your homemade or shop bought pizza. as a cutting board or serving block, and more. American made since 1896, Lodge Cast Iron is one of the most established cookware company. Equipped with safe secure grip, this 14-inch Lodge pizza pan heats quickly and evenly. Great for the oven, grill or over the campfire. #11: Solido Pizza Stone for BBQ, Oven, and Grill. This 14″x16″ rectangular pizza stone by Solido is a good alternative as recommended by users. The SOLIDO pizza stone with speed spiral design is made of materials that can withstand extreme high temperatures up to 2000°F, so it’s well suitable for BBQ, oven, and grill. mscollins999 purchased this pizza stone and shared his review in the homemade pizza demo video below. What’s your favorite kitchen gadget for Pizza? Leave comments and share your thoughts! ← Epibright Intimate Skin Brightening Cream Reviews: Working?